The Unhappy State of the Union: Europe Needs a New Grand Bargain (Athens, Patakis, 2014). The book is also published in French, German, Greek, Spanish and Polish. The crisis has fundamentally transformed the economic and political landscape. Europe has been divided between creditors and debtors, between euro countries and the rest. Divisions run deep within countries as well, as inequalities grow faster. Trust has been low, the economics flawed and the politics toxic. Economic recovery is modest at best; it is also fragile and uneven. Courting with deflation, with large numbers of unemployed and anti-systemic parties on the rise, with public debt much higher than it was at the beginning of the crisis and private debt still very high, Europe seems to be facing the future on a wing and a prayer. Europe needs a new grand bargain. The initiative can only come from the strong, not from the weak. The new grand bargain will require a broad coalition of countries and the main political families in Europe. Supply-side economics and the goal of long-term fiscal consolidation should be matched urgently with measures to boost demand and stimulate growth. The European project also needs to cater more for those on the losing side of a long economic transformation. As it stands, euro governance is neither effective nor legitimate. It needs stronger common institutions, more democratic accountability and an executive able to act with discretionary power. Fear of the alternative will not be able to keep the euro countries together for long. On the other hand, more flexibility and differentiation will be required for countries not ready to take the political leap forward. If Europe continues with its habitual muddling through, it will remain weak, internally divided and inward looking: an ageing and declining continent, increasingly irrelevant in a rapidly changing world and with a highly unstable and poor neighborhood. 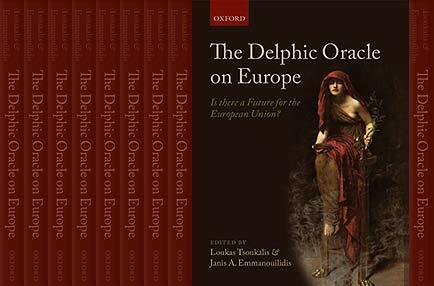 The Delphic Oracle on Europe: Is there a Future for the European Union? (Oxford University Press, 2011). Joint editor (with Janis Emmanouilidis) and author of 'The Delphic Oracle on Europe'.In the launch of the book which took place in Brussels, the main speakers were Mario Monti, Prime Minister of Italy, and Pervenche Berès, Member of the European Parliament and Chair of the Employment and Social Affairs Committee. 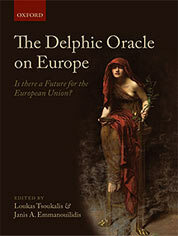 "The Delphic Oracle on Europe: Is there a Future for the European Union?" 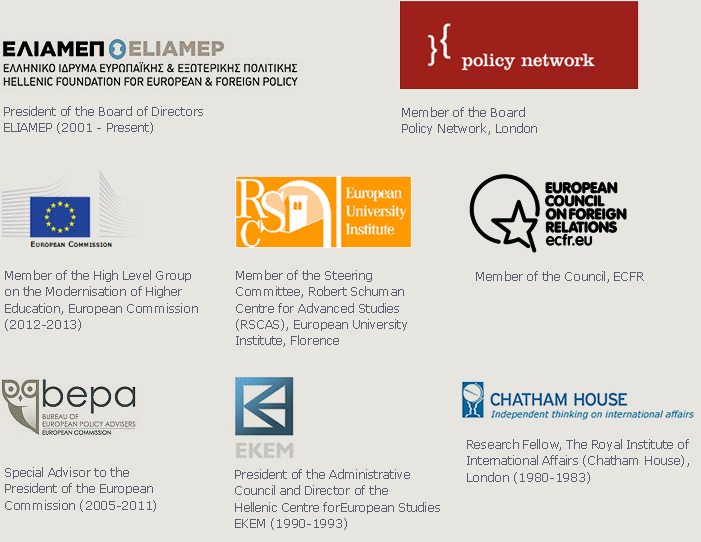 brings together leading thinkers and policy-makers from different academic disciplines and policy-oriented backgrounds from all over Europe.The chapters reflect on ways forward for the European Union (EU) in a time of global crisis and profound change. Contributors debate the institutional and political consequences of the Lisbon Treaty, the reform of economic governance in light of the economic and financial crisis, and Europe's global role in a rapidly changing international and regional environment.The volume is divided into three parts: Part I focuses on the Union's institutions and the question of leadership in an EU27+. Part II concentrates on the key elements of a new European contract, with an emphasis on matters of governance. And Part III discusses the stakes in the agonising search for the EU's global role in a post-Lisbon and post-crisis world. 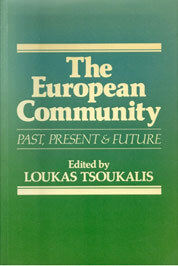 A substantial concluding chapter written by Loukas Tsoukalis pulls the themes of the volume together and ends with a rallying cry for Europe the broad minded, translating the original meaning of the name Europe into new ideas and innovative policies for the 21st century.The list of contributors includes a number of well known expert and practitioners of European integration: Josep Borrell Fontelles, Jonas Condomines Beraud, Olaf Cramme, Janis A. Emmanouilidis, Dieter Helm, Philippe Herzog, Jolyon Howorth, Zaki Laidi, Roger Liddle, Pier Carlo Padoan, André Sapir, and Loukas Tsoukalis. The EU in a World in Transition: Fit for What Purpose? (London, Policy Network, 2009). Editor and author of 'In a world where size matters'. As fears of marginalisation in a rapidly changing world rise, this edited volume considers how the EU can redefine its role as a major political entity and confront the external challenges it must face up to. How it should reform itself, both internally and externally, in order to overcome and respond to the multifaceted challenges of the global age we now live in. In short, the challenge of making the EU "fit for purpose".Needless to say, this is where controversy begins: what exactly is the EU's "purpose" in the 21st century and what kind of reforms are required to render it "fit"? In this volume, leading thinkers and experts provide compelling answers to issues of defence and security, global economic governance, neighbourhood policy, trade, energy and climate change.This pamphlet is one of three volumes containing over thirty original policy papers on the full range of EU challenges. In addition, the synthesis report "An EU "fit for purpose in the global age - can we rise to the challenge?" provides a compact analysis of how the EU needs to evolve and operate if it is to live up to the expectations and hopes of many of its citizens. 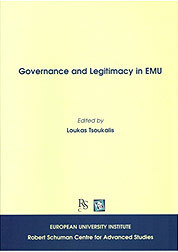 Governance and Legitimacy in EMU EMU (Fiesole, Robert Schuman Centre, European University Institute, 2005). Editor and author of "The Long-Term View". Proceedings of a workshop organised in the framework of the RSCAS Pierre Werner Chair Programme on European Monetary Union, held at the European University Institute on 27 and 28 June 2003. 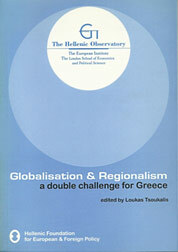 Globalisation and Regionalism: A Double Challenge for Greece (Athens, ELIAMEP/LSE, 2001). Editor and author of "Introduction" and "Driving Forces of Integration". The book presents the minutes of the Conference on "Globalization and Regionalism: A Double Challenge for Greece" organised by the Hellenic Observatory of the European Institute at the London School of Economics in cooperation with ELIAMEP in March 2001. The aim of the conference was that it would contribute to a better understanding of globalisation and regionalism as they affect all European Union countries and Greece in particular. 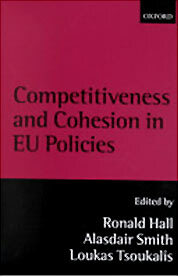 Competitiveness and Cohesion: An evaluation of EU policies (Oxford University Press, 2001). Editor (with Ronald Hall and Alasdair Smith) and joint author of "Introduction" and "Conclusions". An important study of the advantages and pitfalls of the EU's move to greater harmonization.Distribution of resources and opportunity has always been an important factor in European integration. As new and economically weaker join the EU in the future, this will become even more crucial. The reduction of inequalities occupies a prominent place on the European political agenda.This volume examines the cohesion impact of all of the main EU policies. Areas covered include the single market, external trade policy, competition and enterprise policies, research and technological development, the common agricultural policy, transport policy, telecommunications policy, social and employment policy, and structural policies. Two common themes emerge from the investigations. The first is the great complexity in the cause and effect relationships that exist between EU policy interventions and their final impact on the ground in different countries and regions, as well as on social groups. The second is the classical conflict that often exists between competitiveness and cohesion, or between efficiency and equity. This is the first comprehensive and thorough assessment of the cohesion impact of EU policies. It will be invaluable for policy advisers, academics and advanced students. Unorthodox Views on Europe (in Greek), Athens, Papazissis, 1995 Στον τόμο αυτό συγκεντρώνονται είκοσι δύο κείμενα, στην πλειονότητά τους γραμμένα τα τέσσερα τελευταία χρόνια και δημοσιευμένα στον ελληνικό και ξένο Τύπο. Στα κείμενα αυτά ο συγγραφέας επιχειρεί ένα σχολιασμό των πολιτικών και οικονομικών εξελίξεων, με κύρια έμφαση στο θέμα της προσαρμογής της Ελλάδας στη σύγχρονη ευρωπαϊκή πραγματικότητα. Διευκρινίζει ότι με τον όρο προσαρμογή αναφέρεται κυρίως στη συμμετοχή της χώρας στη διαδικασία της ευρωπαϊκής ολοκλήρωσης, και επισημαίνει ότι η προσαρμογή παραμένει ακόμη και σήμερα ένας στόχο ο οποίος συνεχώς μετακινείται προς το μέλλον.Η εμπειρία των τελευταίων χρόνων, κατά τον συγγραφέα, «μας έχει ίσως διδάξει κάτι απλό αλλά και πολύ σημαντικό. Αν δεν θέλουμε να ανακαλύψουμε καινούριους πάτους στο βαρέλι της δημόσιας ζωής του τόπου, θα πρέπει να αντιστεκόμαστε έγκαιρα, δυναμικά και όσο το δυνατόν συλλογικά στη μεγάλη δημαγωγία και το λαϊκισμό που παράγει ακόμη δυστυχώς το πολιτικό μας σύστημα. Όσοι τουλάχιστον δεν ονειρευόμαστε ηρωικές στιγμές εθνικής απομόνωσης και όσοι πιστεύουμε ότι ο εκσυγχρονισμός δεν είναι μία ακόμη κούφια λέξη. Υπάρχει και η άλλη Ελλάδα, που είναι καιρός πλέον να προβάλει τη δική της αντίσταση». 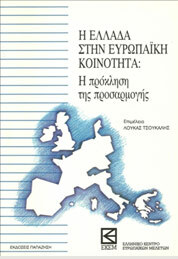 Greece and the European Community: The Challenge of Adjustment (in Greek), Athens, Papazissis, 1993. Editor and author of "Introduction: European adjustment and national particularities" Τα κείμενα που περιλαμβάνονται στον τόμο αυτό αφετηρία τους έχουν τις εργασίες του συνεδρίου που οργάνωσε το Ελληνικό Κέντρο Ευρωπαϊκών Μελετών (ΕΚΕΜ) τον Σεπτέμβριο 1991, στην Αθήνα, με θέμα «Η Ελλάδα στην Ευρωπαϊκή Κοινότητα: Η πρόκληση της προσαρμογής». Αφορμή του συνεδρίου υπήρξε η συμπλήρωση δέκα χρόνων από την ένταξη της Ελλάδας στην Ευρωπαϊκή Κοινότητα.Συμμετείχαν εξέχουσες προσωπικότητες του πολιτικού και δημόσιου βίου καθώς και ειδικοί από τον χώρο της επιστήμης και της διοίκησης, από την Ελλάδα και το εξωτερικό. Βασικός στόχος των εισηγήσεων και των κειμένων του παρόντος τόμου είναι να συμβάλουν στον προβληματισμό γύρω από τα εμπόδια και τις δυσκολίες προσαρμογής που αντιμετωπίζουν η οικονομία μας, η δημόσια διοίκηση και το πολιτικό σύστημα γενικότερα στην κοινοτική πραγματικότητα, καθώς και για τις προοπτικές που διανοίγονται. 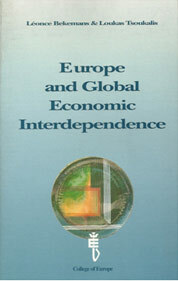 Europe and Global Economic Interdependence (Brussels, Presses Interuniversitaires, 1993). Editor (with Leonce Bekemans) and author of "Introduction". The College of Europe in Bruges has a long standing tradition in the organization of important conferences on key questions of the development of European integration. The results of the Conference on 'Europe and Global Economic interdependence' introduce a new collection called 'The Bruges Conferences'.The completion of the European internal market, the transition to an economic and monetary union, the conclusion of new EC-EFTA agreements, the search for a new political and economic order in Central and Eastern Europe and the negotiations of the Uruguay Round are the main issues on the political agenda in the early 1990s.The European Community faces major challenges in an environment which is undergoing rapid transformation. This is certainly true in the fields of trade, finance and money in which Europe's interests and responsibilities as a regional and global economic power will need to be reconciled. This will require some difficult and occasionally painful decisions. Europe, America and the World Economy (Oxford-New York, Blackwell, 1986). Editor and author of "Euro-American relations and global economic interdependence".The political tension which has often characterized relations between the United States and the European members of the Atlantic Alliance in recent years has also been accompanied by considerable friction in the economic sphere. The term 'uncoupling' quickly passed from the military to the economic vocabulary, while threats of trade wars and retaliatory action have been all too frequently used by both sides.The purpose of this book is to identify the nature and causes of conflict in different areas of economic activity, and assess the conditions upon which improved relations between the United States and Western Europe may rest. In the introduction, Loukas Tsoukalis traces some common threads between different economic issues in Euro-American relations. Robert Crandall and Tim Josling examine steel and agriculture as representative problem-sectors, while Jacques Pelkmans discusses some wider trade issues in the context of a possible reform of GATT. Paul Demaret deals with the extraterritorial dimension of national laws and policies, especially in the area of anti-trust, taxation and the transfer of technology. Niels Thygesen examines the experience with floating exchange rates and their effect on the autonomy of national monetary policies, while Ronald McKinnon puts forward his proposal for international monetary coordination. In the last chapter, Susan Strange discusses the links between politics, trade and money. Each chapter is followed by a short critical comment section written by leading experts from both sides of the Atlantic.This book tackles some of the most important economic issues in Euro-American relations in the context of global economic interdependence. It is addressed to students of international relations and international economics as well as to policy-makers in national governments and international organizations. 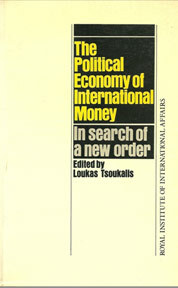 The Political Economy of International Money (London-Beverly Hills-New Delhi, Sage for RIIA, 1985). Editor and author of "The new international monetary 'system' and prospects for reform".The international monetary system has undergone a major transformation since the early 1970s. The suspension, in 1971, of the convertibility of the USA dollar into gold was followed by the abandonment of fixed exchange rates and the consequent growth in the importance of commercial banks in the creation of international liquidity.This book, which arose from a research project conducted at the Royal Institute of International Affairs in London, comprises ten chapters written by leading European experts from the academic world, and from banking and international institutions, on different aspects of the world monetary system as it has developed in recent years. 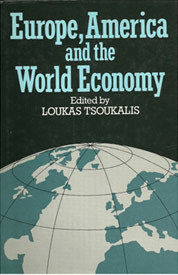 They offer both a critical analysis of recent experience and a detailed discussion of likely trends for the future.The various chapters cover the economic recession of the 1970s and 1980s, the influence of monetary theory on policy decisions, the effects of floating exchange rates and balance-of-payments adjustments, the emergence of a multiple currency standard, the changing character of international liquidity and deficit financing, and the relationship between the IMF and the third world. In conclusion Loukas Tsoukalis highlights recent developments in the international monetary system and draws general conclusions about the nature and feasibility of world monetary reform. The book is intended as a contribution to the growing debate on the international monetary system and its likely evolution. It will be of interest to students and practitioners of international relations and finance. 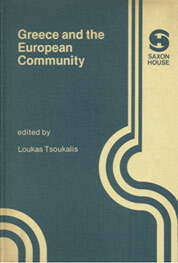 Τhe European Community: Past, Present and Future (Oxford, Blackwell, 1983). Editor and author of "Looking into the Crystal Ball".Published to celebrate the twentieth anniversary of the Journal of Common Market Studies, this book deals with some of the main political and economic aspects of European integration, and the role of the European Community as an international actor.The introduction by Pieter Dankert, President of the European Parliament, discusses the role of the European Community in the 1980s and is followed by articles on the relationship between the nation-state and the Community by Stanley Hoffman, Joseph Weiler and William Wallace; popular participation by Martin Slater, economic integration by Jacques Pelkmans; the role of the EC in the international division of labour by Gilbert Ziebura; the defence dimension by Hedley Bull; Western economic co-operation by Wolfgang Hager and the relation of Europe with Africa and the Middle East by Miles Kahler.Each article is followed by a short critical comment section written by leading experts in the field, and the book ends with a specially written conclusion by Loukas Tsoukalis. Japan and Western Europe: Conflict and Co-operation (London, Frances Pinter, 1982). 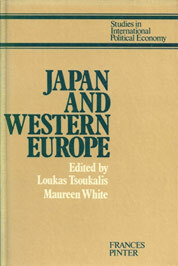 Editor (with Maureen White) and author of "Conclusions".The main purpose of this book is to contribute towards an increased awareness and a better understanding of the issue affecting relations between Japan and Western Europe.Part I outlines the history of European influence in Japan, identifying mutual images and stereotypes. Although the main focus of the book is on the economic dimension of Euro-Japanese relations, this first section provides useful background information, particularly with regards to policy-makers' perceptions of the other side.Part II consists of chapters on the Japanese economy and industrial policy, the political forces which shape Japan's foreign economic policy, and the changing nature of the country's role in the area of High Politics, with the aim of providing the reader with some knowledge of the domestic environment which largely determines Japan's interaction with the rest of the world. Part III deals with the bilateral economic issues. The main emphasis is on the trade imbalance between Japan and the Community, the perceptions of and reactions to the imbalance from both sides as well as the various issues closely associated with the trade problem. Part IV explores the possibilities of gradually moving from conflict to cooperation between Western Europe and Japan. Such possibilities are seen to exist both in the political and the economic field. Also examined are the role that both sides can play in the management of international trade and monetary relations, the North-South dialogue and the preservation of world peace. The European Community and its Mediterranean Enlargement (London, George Allen & Unwin, 1981)Will the second enlargement of the European Community lead to the dilution of common policies and the weakening of institutions? Or will it provide the opportunity for long overdue reforms? These are some of the questions raised in this first authoritative and comprehensive account of the economic and political aspects of the Community's Mediterranean enlargement. Greece has already become a full member, while Spain and Portugal are in the process of negotiating their own accession, now expected to take place during the first half of the 1980s. Thus this second enlargement will continue for some years to be a major issue in Community affairs. 'The European Community and its Mediterranean Enlargement' examines the background to recent economic developments in Greece, Spain and Portugal, their relationship with the Community and the political and economic interests at issue during negotiation. At the same time, the study of enlargement provides an excellent opportunity for a critical appraisal of existing Community policies (especially those affecting industry and agriculture) and a discussion of likely future developments and pressures for change within the context of the 'Community of Twelve'. Loukas Tsoukalis combines a thorough familiarity with Community affairs with a good knowledge of Southern Europe and the ability to work in several European languages. This, together with his background both as economist and political scientist, places him in an almost unique position to tackle this difficult and multi-faceted subject. 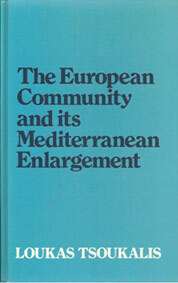 'The European Community and its Mediterranean Enlargement' crosses many disciplinary boundaries. It is equally addressed to students of politics, economics and international relations. Its policy-oriented approach and its topical nature will make it essential reading for everyone with an interest in the future development of the European Community. The Politics and Economics of European Monetary Integration. (London, Allen & Unwin, 1977). 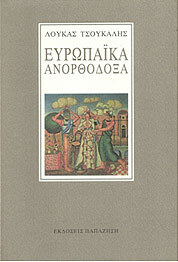 Also Greek edition. His first book was based on his doctoral dissertation accepted by the Oxford University. 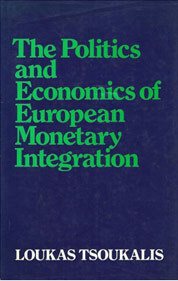 In 1970, economic and monetary union had become one of the central issues in discussions of the future of the European Economic Community. Βy the end of 1973, interest in it had diminished considerably and nobody seriously believed any more in its feasibility within the forseeable future. What happened? Was the issue of monetary union destined to become just another episode in the history of European integration - a big non-event?Dr Tsoukalis does not think so. He sees economic and monetary υnion as an open-ended story and in this book examines its history within the EEC, the policies of the parties involved and the conflicts of interest it has created. Rather than provide yet another theoretical blueprint for action, he aims to provide an analysis of what happened – and why - within both the political and economic environments. Special attention is given to recent developments and new proposals - from the early introduction of a parallel European currency to the Tindemans Report and the concept of a two- tier community.Language difficulties and the apparent technicality of international monetary issues have discouraged political scientists from studying the attitudes and policies of different countries regarding monetary union. Equally, despite these wide political ramifications, the different policies cannot be fully explained without some understanding of the basic theory and mechanics of monetary policy. Dr Tsoukalis's background both as economic and political scientist has enabled him to bring a genuinely 'political economy' approach to bear in the research which led to this book: he is also able to work in all the main languages of the EEC. 'The Politics and Economics of European Monetary Integration' will accordingly attract interest within a wide range of fields of study, including International Relations, European Studies and International Economics. The book is also addressed to the policy-makers both in the EEC and in North America, whose decisions and actions have provided its basic material. The Unhappy State of the Union: Europe Needs a New Grand Bargain, published by Policy Network in partnership with 5 other major European think tanks: Notre Europe (France), Bertelsmann Stiftung (Germany), ELIAMEP (Greece), Istituto Affari Internazionali (Italy) and Elcano Royal Institute (Spain), March 2014. It is translated in French, German, Greek, Spanish and Polish. 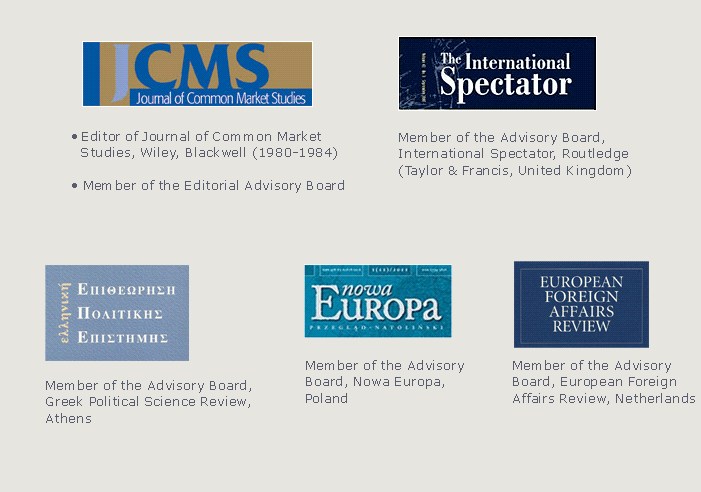 Τhe Political Economy of the Crisis: The End of an Era?, in the special issue ‘Changing the Debate on Europe – the inaugural Dahrendorf Symposium’ in Global Policy, December 2012. ‘An EU “fit for purpose” in the global age: Can we rise to the challenge?‘ (with Olaf Cramme and Roger Liddle),Policy Network, 2009. Translated into French, Greek and Spanish. ‘A new European contract’, in A. Hemerijck, B. Knapen & E. van Doorne (eds. ), Aftershocks: Economic Crisis and Institutional Choice (Amsterdam, Amsterdam University Press, 2009). ‘Global, Social and Political Europe‘, ELIAMEP, Occasional Paper, July 2007. ‘Long on policies but short on politics,the EU needs a breath of fresh air‘, Europe’s World, Spring 2007. 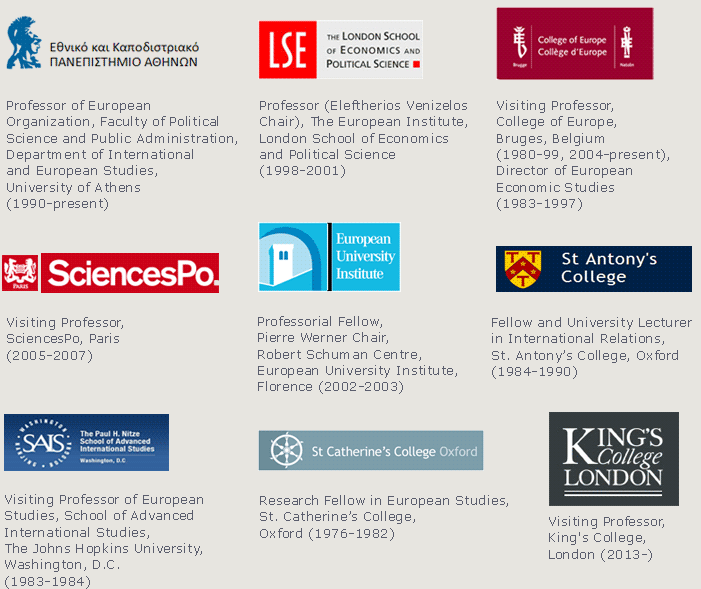 ‘A global and political Europe’, in European Union: The Next Fifty Years – 50+ Top Thinkers Set Out Their Ideas for Europe, London: FT/Agora/LSE, 2007. ‘The European model in a globalised world’, in Europe’s challenges in a globalised world, Global Jean Monnet Conference/ECSA-World Conference, Brussels, 23-24 November 2006 (Brussels, Office for Official Publications of the European Communities, 2007). 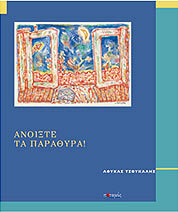 ‘Greek university education in a new European and international environment‘ (in Greek), ELIAMEP Policy Paper, November 2006. ‘Why We Need a Globalisation Adjustment Fund’, in P. Diamond et al., The Hampton Court Agenda: A Social Model for Europe, Policy Network, London, 2006. Interview for the TV channel Euronews-NBC to comment on the Macedonian issue following the vote of the Prespes Agreement by the Greek Parliament, 25 January 2019. Invited by Pavlos Tsimas, SKAI Radio, 12 June, 2018. Interview to the radio station RIK, on the refugee crisis, 5 December, 2015. Participation in the political talk show ‘The last word’, 15 February 2015, on the forthcoming Eurogroup meeting. Interview to the programme Affaires étrangères with Christine Ockrent, on 24 January 2015, on the occasion of the greek parliamentary elections. The interview is available here. 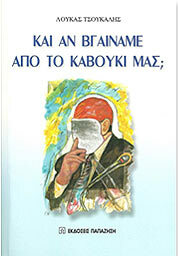 Interview to the radio station Athens 9.84,to Foivos Karzis, 10 May 2014, on the occasion of the release of the new book «Η Δυστυχής Ένωση: Η Ευρώπη χρειάζεται μια νέα μεγάλη συμφωνία», Patakis (in Greek). You may hear the interview here (in Greek, in 01.06.00). Interview to the radio show of www.ertopen.com, with Pericles Vasilopoulos and Anthony D. Papayiannides, 2 May 2014, on the occasion of the release of the new book «Η Δυστυχής Ένωση: Η Ευρώπη χρειάζεται μια νέα μεγάλη συμφωνία», Patakis (in Greek). Interview on the Main News Bulletin of the Hellenic Public Television, on the developments in Ukraine, 5 March 2014. Participation in the political talk show ‘Anatropi’, on the strikes in Greek universities, 18 November 2013. Interview to the political talk show ‘Code Europe’, in the Cypriot tv channel RIK, 14 May 2012. You may watch the interview in the 45th minute of the video. Interview to PBS FRONTLINE, on the economic crisis in Europe and USA. You may see the interview here (37th minute of the fourth episode). Article ‘Ο δικός μας γόρδιος δεσμός’, Kathimerini newspaper, 9 December, 2018 (in Greek). Article ‘Δεν αρκούν λόγια και αφορισμοί’, TA NEA newspaper, 17 November, 2018 (in Greek). Article ‘Πεθαίνει η δημοκρατία;’, with Kishore Mahbubani, Kathimerini newspaper, 23 September 2018 (in Greek). Article ‘Μετά τα μνημόνια, το τίμημα της ελευθερίας’, Kathimerini newspaper, 2 September 2018 (in Greek). Article ‘Ποιος θα αλλάξει πρώτος’, Kathimerini newspaper, 9 July 2018 (in Greek). Article ‘Γερμανοτσολιάδες και Εθνομηδενιστές’, Kathimerini newspaper, 17 June, 2018 (in Greek). Interview ‘Η Ευρώπη σε φάση βαθιάς αμφισβήτησης’, Liberal newspaper, 10 June, 2018 (in Greek). Article ‘Ο λαός, οι δημαγωγοί και το σύστημα’, TA NEA newspaper, 27 January, 2018 (in Greek). ‘In Defence of Europe: Can the European Project Be Saved?’ book review by Professor Helen Louri at the Journal of Modern Greek Studies, December 2017.
Review of the new book of Amb. ret. Vassilis Kaskarelis ‘The perfect storm’, in Kathimerini newspaper, 10 April 2017 (in Greek). Article ‘Υπάρχει ζωή μετά τα εξήντα;‘, Kathimerini newspaper, 26 March 2017 (in Greek). Article “Αναζητώντας σταθερές σε δυσοίωνους καιρούς‘, in a special supplement of Kathimerini newspaper on ‘Greece and the world in 2017′, 31 December, 2016 (in greek language). Article, ‘Πού πάει η Ευρώπη;’, Kathimerini newspaper, 11 December 2016 (in Greek). Article appearing at the ‘International Spectator’ journal of International Affairs, third issue 2016. Article on the Economist ‘Reimagining Europe as a drama between priest, sinner and infidel’, on the book ‘In Defence of Europe’, 16 September 2016. Paul Taylor writes about the book ‘In Defence of Europe’, Reuters, 1 August 2016. Article, Ζην επικινδύνως στην Ευρώπη, Kathimerini newspaper, 3 July 2016. Article, Ποιο είναι το χειρότερο, Kathimerini newspaper, 5 June 2016. Article, Σε αυτούς που έλαχε, Kathimerini newspaper, 17 April 2016. Article, Είμαστε ακόμη στη μετάβαση, Kathimerini newspaper, 21 September 2015. Article, Ποια θα αλλάξει πρώτη;, Kathimerini newspaper, 19 July 2015. Article about the referendum, to the cypriot newspaper ‘Fileleftheros’, 5 July 2015. Article We stay in Europe, Kathimerini newspaper, 30 June 2015. Interview to Bertelsmann Foundation Flashlight Europe, March 2015 issue. Click here to read to full text of the interview. Article in the ‘Review 2014 – A Fresh Look at German Foreign Policy’,invited by Dr. Frank-Walter Steinmeier, German Minister of Foreign Affairs, 20 June 2014. Interview to thetoc.gr,on the occasion of the release of the Greek version of ‘The Unhappy State of the Union: Europe Needs a New Grand Bargain’ (Patakis, 2014), 19 May 2014. Interview to the Greek newspaper TO VIMA, 27 April 2014, on the occasion of the publication of the new book ‘The Unhappy State of the Union: Europe Needs a New Grand Bargain’, published by the think tank Policy Network. Article Necesitamos un nuevo pacto en Europa,in the Sunday edition of the Spanish newspaper El País, 6 Απριλίου 2014, on the occasion of the publication of the new book ‘The Unhappy State of the Union: Europe Needs a New Grand Bargain‘. ‘Steering Europe out of the Crisis’, Policy Network paper, on the occasion of the Progressive Governance Conference, 12 October 2012. Interview to the Turkish Hürriyet Daily News, 7 July 2012 (in English). Op-ed in the German online magazine ‘The European’, 5 July 2012 (in German). You may read the op-ed in English here. Interview to the Cypriot newspaper ‘Fileleytheros’ (Sunday edition), 3 June 2012. Read here the first page of the newspaper and the interview. Article Οι ποιητές και η κρίση,Kathimerini newspaper, 1 April 2012. This text was published with some cuts. Interview in the Norwegian newspaper Dagens Næringsliv, on political and economic situation in Greece, London, 10 March 2012. Statements to the French newspaper Le Temps (4/5/2010) and the Spanish El Mundo (25/3/2010), on the economic crisis and its consequences. Speaker at three panel discussions at the 4th Delphi Economic Forum on Where Europe is Heading to, Brexit, and Greece in the EU. Participation in the book presentation of Christopher Hill, ‘Foreign Policy in the 21st Century’, 6 February 2019. Participation in a public discussion on the future of the EU, held at Public in Syntagma, 5 February 2019. Discussant at a conference on the European values, organized by the Institute for the Mediterranean of the European Public Law Organization (EPLO), 28 January 2019. Speaker at a roundtable organized by the Council of Europe in association with Schools of Political Studies in Thessaloniki, 18 December 2018. Speaker at the European Reformists Summit entitled ’2019: the Democratic Challenge in Europe’ in the central panel debate on the first day together with Sylvie Goulard, Deputy Governor of the Banque de France and former Minister of Defence; Gilles de Margerie, Commissaire Général, France Stratégie; and David Goodhart, renowned British author who wrote about the distinction between Somewheres and Nowheres, Paris 16 and 17 November 2018. Speaker at a conference organized by the Istituto Affari Internazionali in cooperation with the Government of Georgia on differentiated integration in the EU , Tbilisi, 11-12 November 2018. Participant at the Strategic Council meeting of the European Policy Center, in Brussels, under the chairmanship of Herman Van Rompuy, November 8th, 2018. Speaker at the public discussion “Is Greece a blocked country”, organized by ELIAMEP and the Synthesis Dialogue Society in Volos, 7 September 2018. Moderated the public debate organized by ELIAMEP, on Wednesday, September 5th, at Aigli, Zappion, along with Professor Ashoka Mody, Princeton University and former Deputy Director in the International Monetary Fund’s Research&European Departments, Mr. George Chouliarakis, Alternate Minister of Finance and Mr. George Papaconstantinou, former Minister of Finance. Keynote speaker at a meeting organized by the Council of Europe in Strasbourg for Policy Planning Directors from Foreign Ministries of the member states. Speech on the subject of ‘Current challenges to multilateralism’. Strasbourg, 8 June, 2018. Annual Edward and Emily McWhinney Memorial Lecture: Brexit and the European Union: Is There Life After the Divorce?, Stavros Niarchos Foundation Centre for Hellenic Studies, Vancouver, 21 March 2018. Participation in the presentation of the ELIAMEP book ‘Understanding the Greek crisis: Answers to crucial question on the state, the economy and Europe’, Papazisis publications, edited by D. Katsikas, K. Filinis and M. Anastasatou. Athens, 18 January, 2018. Participation at the public dialogue event in Brussels on ‘2018: A turning point for European integration?’, organized by the European Policy Centre (EPC), Brussels, 9 January, 2018. Speaker at a roundtable discussion at a Conference jointly organized by the Foundation for European Progressive Studies (FEPS) and the Fundación Alternativas on the future of the European Monetary Union, Madrid, 30 November 2017. Participation in a meeting on the Future of the EMU organized by the Foundation for European Progressive Studies (FEPS), Brussels, November 9, 2017. Participation in the Strategic Council meeting of the European Policy Center (EPC), Brussels, November 8, 2017. ‘What kind of reform for Europe?’, speech at the Australian University in Canberra and participation to a round table discussion at the Department of Foreign Affairs and Trade, October 25, 2017. 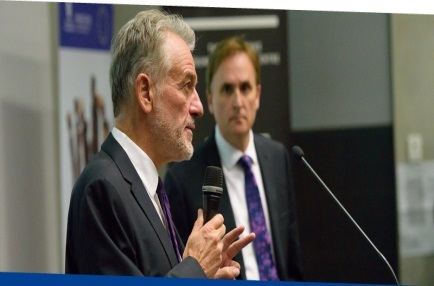 Κeynote speaker at a conference organised by the Hawke EU Centre of the University of South Australia, October 18, 2017. Speaker at the University of Auckland, New Zealand, ‘In defense of the European Project’, October 16, 2017. 14th ELIAMEP’s European Seminar: ‘A turning point for European Integration?’, Nafplio, 7-9 September, 2017. Panelist at the conference organised by Policy Network and FEPS (Foundation for European Progressive Studies) at St. Catherine’s College, Oxford, 3-4 July 2017. Presentation of the book: ‘In Defence of Europe: Can the European Project be Saved?’, the first of a series of book presentations of the 2017 ‘EPRS Book Talks’, Brussels, June 22nd, 2017. Participation in the concluding panel of the European Union Institute for Security Studies (EUISS) Annual Conference on: ‘European security, transatlantic relations, global challenges’, Brussels, June 20th, 2017. Speaker at the European Commission’s Reflection Group on the Future of the European Civil Service (GRASPE) on: ‘Europe’s Multiple Crises: An Increasingly Ungovernable Post-Modern Empire?‘, Brussels, June 20th, 2017. Keynote speaker of the European Roundtable 2017 on: ‘Profiling the European Union in Times of Change – How to safeguard and strengthen the EU’s values, principles and institutions?’ in Lisbon. The conference is organised by Konrad Adenauer Stiftung, Lisbon, June 8th, 2017. Discussant at a conference on ‘Connectivity and the Future of European Integration’, University of Oxford, June 2nd, 2017. Participation in a roundtable discussion on the future of Europe, organised by the Faculty of Law of the Aristotle University of Thessaloniki and the Thessaloniki BAR, 16 May, 2017. Public discussion with Margaritis Schinas on the future of Europe, Old Parliament House, 8 May, 2017. 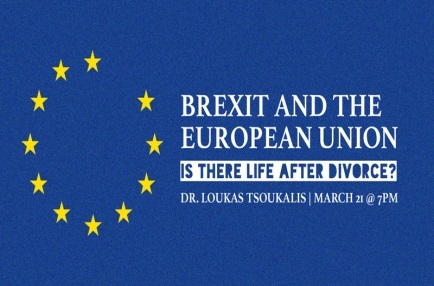 Speaker at the Konstantinos Karamanlis Foundation on: ‘Europe in Crisis-Is there a way out?’, organised by the Hellenic Alumni Association of the Tuflts University, Athens 4 May, 2017. Discussant in the event conferring the title of doctor honoris causa by the School of Economics and Political Sciences of the National and Kapodistrian University of Athens upon Professor Dame Helen Wallace, 27 April, 2017. Keynote lecture: ‘60 years after the Rome Treaty: time to reboot the European Project?‘, at the Egmont Royal Institute for International Relations, Brussels, 22 March 2017. Presentation of the book ‘In defence of Europe’ in Rome, with the participation of the Under-Secretary for European Affairs of Italy, Sandro Gozi. Speaker at a special event organized by Istituto Affari Internazionali, on the occasion of the 60 years after the ratification of the Treaty of Rome, Rome 20 March 2017. Discussant at the presentation of the book of Ambassador ret., Vassilis Kaskarelis, ‘The perfect storm’, 14 March 2017. Participation in a panel discussion on the future of Europe at the Delphi Economic Forum, 28 February 2017. Participation in a panel discussion on Brexit and the EU Foreign Policy with Prof. Karen Smith, Megaron Plus, 15 February, 2017. Lecture on the future of Europe: ‘Can the European project be saved?’, Info Point, European Commission, Brussels 23 January, 2017. Speaker at the Hellenic Observatory of LSE, on the occasion of the 20th Anniversary of the Institute, on ‘Greece: Modernisation and Europe 20 years on’, 25 November, 2016. Keynote speaker at the Institute of International and European Affairs in Dublin, on the Economic and Monetary Union in the Euro Area, 23 November, 2016. Participation in a workshop on: ‘Europe Unbound’, organized by the University of Oxford, 21-22 November, 2016. Speaker at the discussion held by the Alumni Association of the American College of Greece, on “The economic dimension of geopolitics and the future of Europe”, on 2 November 2016. Speaker at the 5th International Symposium of Thessaloniki ‘The world in 2017 and beyond: In search of stability‘, held by the Northern Greece Entrepreneurs Cultural Society,the Konrad Adenauer Stiftung and the Navarino Network, on 22 October, 2016. Participation in the Conference ‘Greece’s turn?’ organized by the Fletcher School, Tufts University on 14 October 2016. Presentation of the book ‘In Defence of Europe: Can the European project be saved?’ at the Center for European Studies, Harvard University, 13 October, 2016. Discussion followed with Boston University Professor, Vivien Schmidt. Participation in a conference organized by the Ditchley Foundation on ‘The EU divorce and after: rebuilding Britain’s relationships’, Oxford, 6-8 October, 2016. Participation in a debate organized by the BBC World Questions regarding the future of Europe after the Hungarian referendum on the refugee relocation, Budapest 5 October, 2016. Participation in a conference organized by YPO, on the challenges facing the EU, Athens 23 September, 2016. Speaker at the Athens Democracy Forum, on the US Elections. Among the co-panelists are Paul Krugman and Ian Lesser, 14 September, 2016. Award of the Legion of Honor of the French Republic. 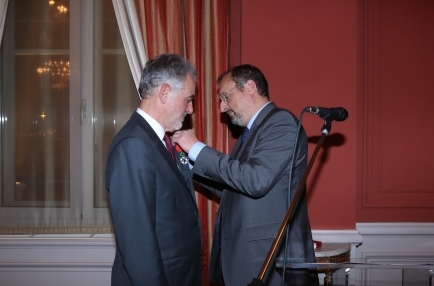 The President of the French Republic has named Loukas Tsoukalis Chevalier dans l’Ordre national de la Légion d’honneur for his contribution to the reflection on the future of the Union and his exceptional engagement in European integration. First speaker at the international conference Menendez Pelayo, in Santander, northern Spain, on ‘Europe’s multiple crises-is there a way out?’, 29 August, 2016. Presentation of the book: ‘In Defence of Europe: Can the European Project be saved?’, at the Rafael Del Pino Foundation, in Madrid, on 15 June, 2016. You can watch the presentation here. Discussion with Herman Van Rompuy on the future of Europe: ‘Vision for Europe, Can the European Project be saved?’, at the European Policy Center, 6 July, 2016. Presentation of: ‘In Defence of Europe: Can the European Project be saved?’, at Fundacion Rafael del Pino in Madrid, 16 June 2016. Presentation of the new book: ‘In Defence of Europe: Can the European Project be saved?’, at the Policy Network in London, 15 June 2016. 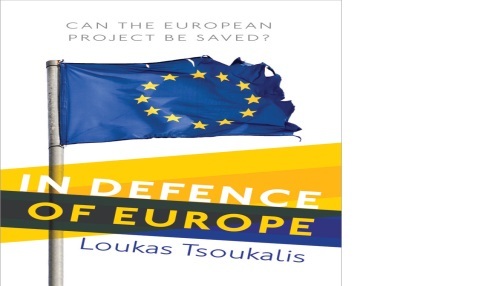 Participation in seminar and launch of the new book: ‘In Defence of Europe: Can the European Project be saved?’, at the University of Oxford, St. Anthony’s College, 14 June 2016. Participation in the Progressive Governance Conference organized jointly by Policy Network and the Swedish Social Democratic Party, 26 and 27 May 2016. Participation in the 25th Annual Hymen Minsky Conference on: ‘Will the Global Economic Environment constrain US Growth and Employment?’, Levy Institute, 13 April 2016. Speaker at the Center of European Studies of the University of Harvard on:’Governing Europe after the Crisis – Efficiency and Legitimacy Challenges’, 12 April 2016. Participation in the Center of European Studies Director’s Seminar on : ‘The Emerging European Disunion’, 11 April 2016. Lecture at the University of Harvard on: ‘Europe’s multiples crises: is there a way out?’, 31 March 2016. Lunch talk with Prof. Vivien Schmidt at Boston University on the european crisis: ‘Europe in crisis- is there a way out?‘, 30 March 2016. Lecture at Princeton University on: ‘Europe’s multiple crises: is there a way out?’, 23 March, 2016. Lecture at Princeton University on: ‘Greece’s never ending crisis : is there light at the end of the tunnel?’, 22 March,2016. Speaker at the Boston Council on Foreign Relations on: ‘Europe’s Multiple Crises: Is There a Way Out?’, 2 March 2016. Moderation of a discussion held at the Harvard Kennedy School on: ‘The Greek Crisis and the Euro: Is there a Way out?’ on February 20th, 2016. The speakers of the panel were: Dimitris Daskalopoulos, Former Chairman of the Hellenic Federation of Enterprises (SEV); Athanassios Orhpanides, Professor of the MIT and former governor of the Central Bank of Cyprus; Eva Kaili, Member of the European Parliament; and Ed Parker, Managing Director of the Europe, Middle East and Africa Team at Fitch Ratings, London. The panel discussion was part of the annual European Conference 2016, organised by the students of the University of Harvard. Welcoming remarks at the ‘Civil Society Dialogue on Europe’, organized by the Das Progressive Zentrum, at the Impact Hub Athens, December 7, 2015. Public discussion with the German Minister of State for Europe, Michael Roth, follwed. Participation in a conference organised in Rome on 13-14 November 2015 for the 50th Anniversary of the Istituto Affari Internazionali (IAI). He spoke in the first session on ‘Governing Europe: the Challenges of Differentiated Integration’. The programme of the event is available here. Participation in the Annual TATRA Summit in Bratislava. Professor Loukas Tsoukalis participated in a night owl session on November 4th, along with David Lidington, Minister of State for Europe of the United Kingdom of Great Britain and Northern Ireland; Jean-Claude Piris, former Legal Counsel, Council of the European Union and Ambassador Peter Jarvocik, Permanent Representative, Ambassador Extraordinary and Plenipotentiary, Permanent Representation of the Slovak Republic to the EU. Simon Nixon, Chief European Commentator, The Wall Street Journal moderated the discussion. Participation in a panel discussion on the european crisis, at a Conference organized by the Networking European Citizenship Education in Thessaloniki, on 23 October, 2015. Participation in the 6th TedX Academy on Evolution, at the Athens Concert Hall, on September 26, 2015. Podcast on the Greek referendum by the European Council on Foreign Relations (ECFR), July 3rd, 2015. Speech at a conference organized by the Council for the United States and Italy, on June 5 and 6, in Venice. He participated at the opening panel discussion on ‘Europe and the 2015 elections: Greece, UK, Denmark, and Spain’. Among the many distinguished speakers who will participate at the conference: Joaquin Almunia, former Vice-President of the European Commission; Peter Sutherland, Chairman, Goldman Sachs International; Eric Schmidt, Executive Chairman, Google; Lorenzo Bini Smaghi, Chairman of the Board, SNAM and Chairman of the Board, Société Générale along with the Italian Minister of Foreign Affairs, Paolo Gentiloni and the Minister of Economy and Finance, Pier Carlo Padoan. Welcome remarks at the conference on ‘Greece and the EU: Learning from the past, shaping the future’ jointly organized by Europe Direct ELIAMEP, Europe Direct of the City of Athens and Europe Direct ACCI on the occasion of Europe day, 13 May 2015. Speaker at a wokshop on ‘ Greece and the Eurozone’, organized by IOBE (Foundation for Economics and Industrial Research), on April 29, 2015. Keynote speaker on Greece at the dinner organized by Euro 5050 on the occasion of a workshop held in Frankfurt on March 30. Participants include high level economists, bankers and officials from various national backgrounds. Speaker at the annual fair of the Athens College, on Saturday 28 March 2015. Keynote speaker at Johns Hopkins University SAIS Europe in Bologna, on 26 March 2015. The title of his lecture will be ’Europe in crisis: is there a way out?’. The event will be sponsored by Evens Foundation. Discussant for the lecture of Professor Kevin Featherstone, on: “European obligations and national state cultures: a bridge too far?”. 23 March 2015 at the Megaron Athens Concert Hall. Speaker at the public debate on ‘Social justice in the EU and Greece: How to prevent a lasting social division?’, on March 20th 2015. The event was held in order to discuss the findings of the “Social Justice in the EU” study, a recent publication of the German think tank Bertelsmann Stiftung. For more information click here. Speaker at the Ideas Lab, organized by CEPS, on the need for a European Treaty Reform, Brussels 26 February 2015. Please find here the full programme of the workshop. 2nd Annual Conference of the Crisis Observatory, Hellenic Foundation for European and Foreign Policy. Coordinator of the Round-table discussion ‘Towards a Lost Decade? The Challenge of Solidarity and Inclusive Growth in Europe’. 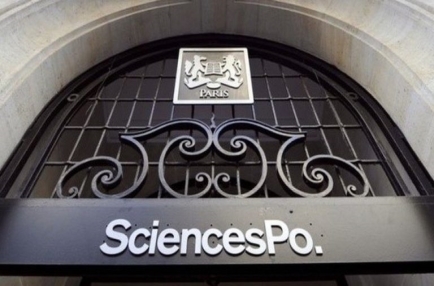 The conference took place on December 16, 2014 at the French Institute. 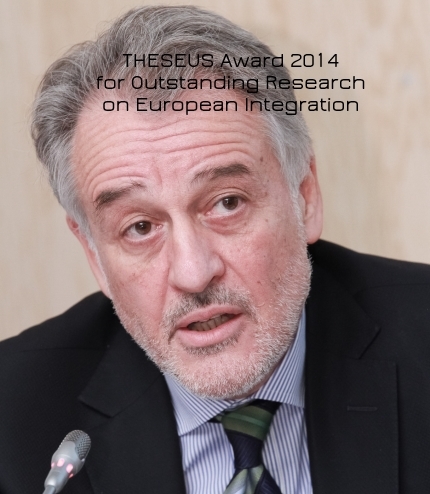 THESEUS award 2014 for outstanding research on European integration. 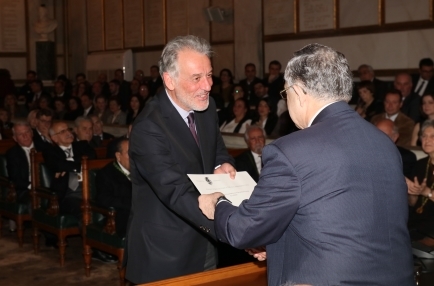 The award ceremony took place in Riga, Latvia on December 4 during the Latvia Pre-Presidency Ceremony. Latvia will hold the Presidency of the Council of the European Union in the first half of 2015. For more information on the award press here. Keynote speaker at the conference ‘Redesigning EMU governance in light of the Eurozone crisis’ of the Barcelona Centre for International Affairs (CIDOB). The title of his speech was ‘The Eurozone Crisis: The Big Picture’. You can find the programme of the conference here. Cyril Foster Annual Lecture, Oxford November 13th 2014. 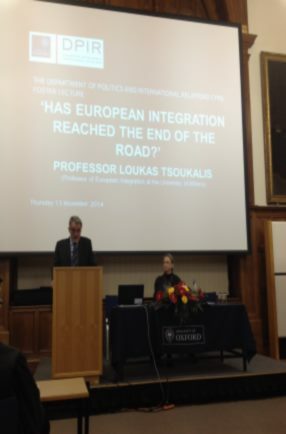 Has European Integration Reached the End of the Road?On 13 November, Loukas Tsoukalis gave the Cyril Foster Lecture 2014 which is the principal annual guest lecture at the University of Oxford in the field of International Relations. Click here for the text of the lecture. Participation in the book presentation ‘Europe in the Storm’ by Herman Van Rompuy. Papadopoulos Publishing, the Hellenic Foundation for European & Foreign Policy (ELIAMEP) and the French Institute of Greece organised the presentation of the Greek edition of the book Europe in the storm: Promise and prejudice authored by the first President of the European Council Herman Van Rompuy. The event took place on Friday 7 November 2014. Speech at the meeting of the High Level Group on Own Resources, Brussels 15 October 2014. 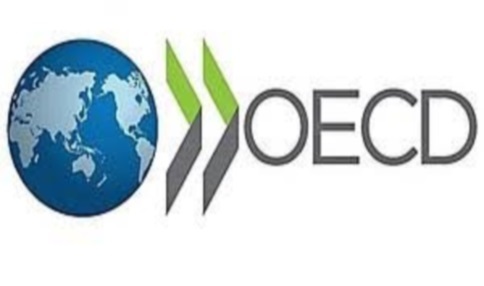 The task of the Group is to undertake a general review of the EU own resources system, which should be guided by the overarching objectives of simplicity, transparency, equity and accountability. The group is chaired by Mario Monti, former Italian Prime Minister and former European Commissioner. Presentation of the book ‘The Unhappy state of Union: Europe Needs a new grand bargain’ in London, 7 October 2014. The book presentation and lecture was organized bu UCL (University College London). Participation in a lecture on ‘The Future of the EU’ at King’s College London, on October 6. The panel discussion brought together three leading experts on the EU, Professor Brigid Laffan, Director at the Robert Schuman Center for Advanced Studies, European Institute University, Florence and Professor Anand Menon, Director of the Europe in Crisis Project, King’s College, London. The event was part of the Europe in Crisis Project of King’s College. Yoy may find here a short comment on the crisis in Southern Europe. 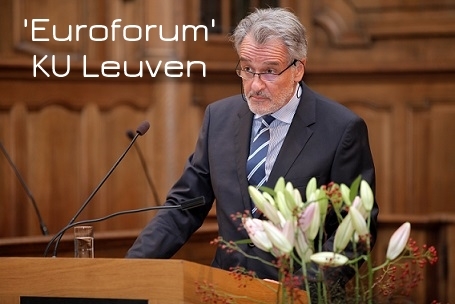 Κeynote lecture at the annual Euroforum Conference of the University of Leuven, the biggest and oldest University in Belgium, together with the President of European Council, Mr. Herman Van Rompuy, on 16 September. You may read the speech here as well as the speech of Mr. Van Rompuy. For more information you may see the programme here. Speech at the opening session of the annual meeting of the European Social Network, held in Rome, 7-9 July 2014, on the occassion of the Italian Presidency. Mr. Giuliano Poletti, Minister of Labour and Social Policies in Italy, and Mr. Nicola Zingaretti, President of Lazio Region, spoke at the same panel. For more information you may visit the official site and watch the video of the meeting. Book launch event for the title ‘The Unhappy State of the Union: Europe Needs a New Grand Bargain’ in Rome, 30 June 2014. The event was organized by Instituto Affari Internazionali one day before Italy assumes the Presidency of the European Council. You may see the invitation here. Moderator of the public debate ‘Creating Jobs: Europe’s biggest challenge after the crisis’, co-organized by the Crisis Observatory of ELIAMEP and the Friedrich Ebert Foundation/ Athens Office, Aegli – Zappeion, 19 June 2014. Speakers were: Prof. Dr. Peter Bofinger, Chair for Monetary Policy and International Economics, University of Würzburg; Member of the German Council of Economic Experts, Mr. Dimitri Papalexopoulos, Vice President, Hellenic Federation of Enterprises (SEV), Prof. Savvas Robolis, Prof. Emeritus, Panteion University; Former Scientific Director of the Trade Union’s Institute of Labour, INE-GSEE and Mr. Dimitris Tsigos, President, YES – European Confederation of Young Entrepreneurs and member of the Hellenic Start-up Association. Participation in the Annual Council Meeting of the European Council on Foreign Relations (ECFR), Rome, 12-13 June 2014. For more information you may click here. Policy Briefing on ‘The unhappy state of the Union. Time for a new “grand bargain”, organized by the European Policy Centre (EPC) and the Bertelsmann Stiftung, in Brussels on 11 June, on the occassion of his new book ‘The Unhappy State of the Union: Europe Needs a New Grand Bargain’. The presentation was followed by a question and answer session jointly chaired by Janis A. Emmanouilidis, EPC Director of Studies, and Thomas Fischer, Executive Director of the Brussels Office of the Bertelsmann Stiftung. Participation in the expert panel debate with Mr. Joaquín Almunia, Vice-president of the European Commission, in the framework of the conference on ‘The EU after the European elections’, organized by the think tank Policy Network, London, 5 June 2014. You may see the programme here. Keynote speaker in the debate on ‘State of the Union after the EP elections’, Warsaw, 27 May 2014, on the occasion of the release of the Polish version of ‘The Unhappy State of the Union: Europe Needs a New Grand Bargain’. Participation in the Governance Report 2015 edited volume Authors Workshop, at the Hertie School of Governance in Berlin, May 26, 2014. The main subject of the Governance Report 2015 will be the future of the EU. Speech to the members of the Committee of Permanent Representatives in the European Union (COREPER II),on ‘Does Europe Need a New Grand Bargain?’, Zappeio, 22 May 2014. The two-hour debate was coorganized by ELIAMEP and the Permanent Representation of Greece in Brussels. Mr. Janis Emmanouilides, Research Director of the European Policy Centre (EPC) in Brussels (‘The State of the Union and future prospects for European integration’) and Mr. Thanos Dokos, Director General of ELIAMEP (‘Increasing turbulence in Europe’s neighbourhood(s)’) also participated in the debate. Book launch event for the Greek version of the title: ‘The Unhappy State of the Union: Europe Needs a New Grand Bargain’, published by Patakis Publishers, Monday 5 May, at Stoa tou Vivliou. Speakers in the event were Mr Tassos Giannitsis (Former minister, Professor emeritus at the University of Athens), Ms Anna Diamantopoulou (President of DIKTIO-NETWORK for Reform, former European Commissioner and Minister), Mr Kyriakos Mitsotakis (Minister of Administration Reform and e-Governance), Mr George Stathakis (SYRIZA MP and Professor at the University of Crete) and the author. Ms Matina Stevis (correspondent of The Wall Street Journal in Brussels) moderated the discussion. You may read the report (in Greek) of the event and watch the video. Speech at the international conference on ‘Ten Years After the 2004 EU Enlargement: Achievements and Next Steps’, Vienna, 24-25 April 2014. You may watch the video of the speech here. Participation in the international conference on ‘Non peripheral partners: Greek-Spanish relations within the European Union’, organized by ELIAMEP and the Royal Institute Elcano, Madrid, 10 April 2014. Presentation of the new book ‘The Unhappy State of the Union: Europe Needs a New Grand Bargain’, in the Spanish Royal Institute Elcano, 9 April 2014. Keynote Speaker in the conference ‘From Austerity to Growth and Recovery: overcoming the socio-economic consequences of Greece’s Crisis’, organized by the European Economic and Social Committee (EESC), Zappeio, Athens, 20 March 2014. You may read the programme here. Introduction to the lecture delivered by H.E. the President of Federal Republic of Germany, Mr Joachim Gauck,on ‘Europe: Our common heritage and future’, organised by ELIAMEP and German Embassy in Athens, on 6 March 2014 at the Acropolis Museum, in the presence of H.E. the President of the Hellenic Republic, Dr. Karolos Papoulias. You may read the introduction (in Greek) and the speech of Mr. Gauck. Public debate on ‘New Pact for Europe’ and presentation of the report, 26 February 2014. You may watch the video of the event here (in Greek). Κeynote lecture at the launching event for ACCESS Europe, a new European Centre set up jointly by the two big universities of Amsterdam. The title of the keynote lecture was ‘What Kind of Europe After the Crisis?’, and the discussants were Frank Vandenbroucke, Professor and former Minister of Belgium, and Brigid Laffan, Director of the Schuman Centre at the European University Institute in Florence. The event took place in Amsterdam on 22 January with the participation of the Dutch Minister of Education. You can find more information here as well as the video of the speech. Participation in the Progressive Forum,Keramikos, Athens, 18 January 2014. You may see the programme here (in Greek). Speech at the launch of the book ‘Greece in the Euro: Economic Delinquency or System Failure?’, written by Research Fellow of ELIAMEP, Dr Eleni Panagiotarea. Mr Kyriakos Mitsotakis (Minister of Administration Reform and e-Governance) and Professor Gikas Hardouvelis (University of Piraeus) also spoke on the book. The event took place at Onassis Cultural Centre, 13 January 2014. You may watch the video of the event here (in Greek). Speech at the open discussion on ‘Is National Consensus Possible in Greece? ;’ in the framework of the 1st Annual Conference of the Crisis Observatory of ELIAMEP, 13 December 2013. You may watch the video of the discussion here (in Greek). Speech at the public debate on ‘Dilemmas, challenges and opportunities for Greek foreign policy’, which was organised by ELIAMEP, IOBE, KANTOR, the Citizens Movement, Transparency International – Greece and Megaron Plus, 12 December. You may see the video of the event here (in Greek). Moderator of the discussion on ‘Global governance out of order?’, Mr Pascal Lamy (former Director General of World Trade Organization and Honorary President of Notre Europe-Institute Jacques Delors) was the keynote speaker. 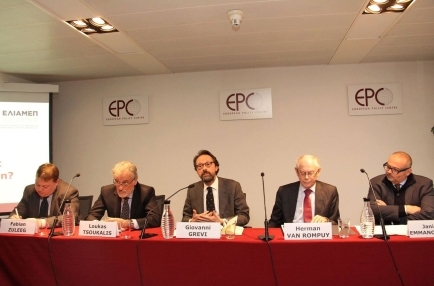 The event was organised by the French Institute in Greece, in co-operation with ELIAMEP’s Crisis Observatory on 9 December 2013. You can watch the video of the discussion here. Speech at the book launch event for the title: ‘A Contemporary Odyssey’, an autobiography by former President of Cyprus George Vassiliou, held in the University of Cyprus, 29 November 2013. You may read a reference of the Cypriot press here (in Greek). On 15 October the book launch event also took place in the Greek Ministry of Foreign Affairs. Former Prime Minister of Greece Costas Simitis and the author also talked on the book. You may read the speech of Loukas Tsoukalis here (in Greek). Participation in the panel discussion on ‘What Binds Europe Together?‘,at the Presidential Residence, Schloss Bellevue, 26 November, on an invitation by the Federal President of Germany, Mr Joachim Gauck. His fellow panelists were: Mr. Andrea Bolaffi (Italy), Mrs. Sylvie Goulard (France), Mr. Ivan Krastev (Bulgaria) and Mrs. Daniela Schwarzer (Germany). The panel was chaired by Mrs. Petra Pinzler, journalist from Die Zeit. The Federal President gave an introductory speech and also closed the session with some final words. You may watch videos from the discussion here -1, 2, 3, 4. Speech at the international conference in Belgrade on ‘The Fate of Democracy: Global Challenge, Local (Non) Responses’.This is the 10 year anniversary event of the Belgrade Fund for Political Excellence, 14 November 2013. You can find the programme here. Participation in the conference of the Levy Economics Institute, on ‘The Eurozone Crisis, Greece and the Experience of Austerity’, Megaron Athens International Conference Centre, 8-9 November 2013. You may see the programme here. Speech at the public event organised by the Alliance of Liberals and Democrats for Europe, Amphitheatre of the Old Parliament Building, Athens, 7 November 2013. Public talks at Harvard University, on the general theme of Europe in a Post-Crisis World, 31 October and 1 November 2013. In the opening session, the fellow panelists were Lawrence Summers, former Secretary of the Treasury of the United States and former President of Harvard University, Professor Peter Hall and Professor André Sapir, chaired by Professor Jeffry Frieden. You can find here the programme and the video of the opening session. Κeynote speaker at the ‘Sino-European Strategic Dialogue’, organized by the leading European and Chinese international relations institutes, CICIR, Asia Centre, DGAP and EUISS, in Beijing, 21-22 October 2013. The subject of the speech was the political economy of European integration and perspectives for the future. Alcuin Lecture 2013 at the University of Cambridge, on ‘Is there a future for the European Union – and with Britain in it?’, 17 October 2013. You may find the lecture here. Speech at the Economic Conference AGORA, in the 4th Athens Biennale, 12 October 2013. You may find more details here. Moderator of the discussion on ‘Technology as a spark for growth’. Mr. Eric Schmidt, Executive Chairman of Google, was the keynote speaker of the event, held on Athens Concert Hall, 10 October 2013. You may find the video here. Speech at the 8th Pan-European Conference on International Relations,Warsaw, 19 September 2013. Professor Hubert Zimmermann (Philipps University Marburg, Germany), Professor Fritz Scharpf (Max Planck Institute, Cologne), Professor Henrik Enderlein (Hertie School, Berlin), Dr Guntram Wolff (Bruegel, Brussels) and Dr Simona Leila Talani (King’s College, London) also participated in the roundtable discussion on understanding the Euro Crisis. You can find more information here. Moderator of the lecture of the Prime Minister of Italy,Mr. Enrico Letta, on ‘How can Europe Come out of the Crisis?’ Athens, 29 July 2013. For more information click here. Participation in the 10th European Seminar of ELIAMEP, on ‘Europe in Crisis – Citizens in Protest’, held in Nafplio, 4-7 July 2013. For more information click here. Speech at the public debate ‘Crisis and the Financial Sector: Developments and Prospects in Greece and Europe’,co organized by the Greek International Business Association (SEVE) and ELIAMEP’s Crisis Observatory, Thessaloniki, 17 June, 2013. For more information click here. Participation in the debate on European economic crisis, in the framework of the three-day seminar of the programme ‘European Young Leaders: 40 under 40′, co organised by EuropaNova και Friends of Europe, Athens, 13 June 2013. You may see the programme here. Moderator of the discussion on ‘The euro: assessment and prospects’. Mr. Jean-Claude Juncker, Prime Minister of Luxembourg and former Eurogroup President, was the keynote speaker. The event was co-organised by the Embassy of Luxembourg in Athens, Megaron-the Athens Concert Hall and ELIAMEP, 10 June 2013. For more information click here. Moderator of the discussion on ‘Working together towards European recovery’. President of Eurogroup and Minister of Finance of the Netherlands, Jeroen Dijsselbloem was the keynote speaker. The event was coorganized by the Crisis Observatory of ELIAMEP and the Embassy of the Kingdom of the Netherlands in Athens, 31 May 2013. You may see more information here. Speech at a public debate in Zagreb,on the future of Europe, 20 May 2013. The debate took place in view of the country’s adhesion to the EU on 1 July 2013. Member of the European Parliament (MEP) and former Foreign Minister of Croatia Tonino Picula, MEP Andrej Plenković and Professor at Cambridge University Brendan Simms also participated in the panel. Lecture series on the Euro crisis in Brazil,invited by the Brazilian research institute Fundação Getulio Vargas. Specifically, he gave a lecture to ‘2013 School on the European Union‘ (6-7/5), participated in the 2nd Europe Day Conference (8/5) and in the 2nd Workshop on European Union Research (10/5). Speech at the public debate organised by the French-German Youth Office (OFAJ/DFJW),in co-operation with the French and German Ministries of Foreign Affairs, Thessaloniki, 20 April 2013. You can find more information on the public debate and the seminar here. Speech to the Association of Greek Businessmen, on the eurozone crisis and challenges for Southern states, Athens, 18 April 2013. You may see the programme here (in greek). Speech at the public debate on ‘How to restore Greece’s lost credibility’, co-organized by ELIAMEP, IOBE, KANTOR, the Citizens Movement, Transparency International-Greece and Megaron Plus, 21 March 2013. You may access the speech and the video of the event here (in Greek). Speech at the Symposium ‘Konstantinos Karamanlis: then and now’,organised by the Karamanlis Foundation and Megaron Plus, 6 March 2013. You can access his speech and the video of the event here (in Greek). Speech at the international conference on ‘Prospects for Revival in the Eurozone-and what place for Britain in Europe?’, co-organised by the Policy Network, the European Commission’s UK Representation and the City of London Corporation, 28 February 2013. Professor Tsoukalis spoke on the eurozone crisis at the same panel with Olli Rehn, Vice-President of the European Commission. Herman Van Rompuy, President of the European Council was the keynote speaker. Keynote speaker in the debate ‘The Greek crisis and the Eurozone: a cure worse than the disease?’, organized by Istituto Affari Internazionali in Rome, 6 February 2013. Lorenzo Bini Smaghi, former member of the ECB Executive Board was among the speakers. You may access the invitation of the event here. Moderator of the public debate ‘Greek Universities: The complete makeover’, organized by ELIAMEP, IOBE, KANTOR, the Citizens Movement, Transparency International – Greece and Megaron Plus, 13 December 2012. For more information click here. You may also watch the video here (in Greek). Speeches on ‘Legitimacy: Technocracy vs Populism’, in a series of seminars on the European crisis, organised by the University of Oxford (St. Anthony’s College) and the European Council on Foreign Affairs, as well as in the Black Coffee Morning event, organised by ECFR, 23-24 October 2012. Opening keynote address at the Progressive Governance Conference, organized by the think tank Policy Network in Dublin, 12 October 2012. The Conference brought together high level politicians and analysts from across Europe. You may read the paper entitled ‘Steering Europe out of the Crisis’ here. Speech on ‘Where next for the politics of the Eurozone crisis?’, at the event organized by the Institute of International and European Affairs, Dublin, 11 October 2012. You may watch the video here. Speech on ‘Reform-Crisis-Europe’, at the conference organized by the Alumni Association of the National School for Public Administration and the Region of Attica, on ‘Redesigning the Public Administration’, in the Acropolis Museum, October 5, 2012. See the programme here. Speech at the First International Symposium of Thessaloniki, on ”The Decline of the West and Europe?”, Thessaloniki, 30 September 2012. View video (in Greek) and more information. Speech in the University of Sussex, at the 20th Anniversary Conference of the European Institute, on ‘The Future of Europe: Progress or Decline?’, 28 September 2012. View the programme here. Speech at the launch of the book ‘Bright Day’ by Amanda Michalopoulou, (in greek) in Hystorical Archives-Museum of Hydra, 21 July 2012. You may see the invitation here. 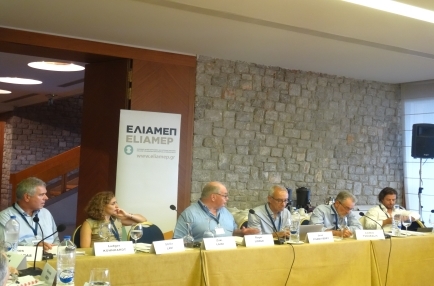 Participation in the 9th European Seminar of ELIAMEP, on ’Global Europe in a Changing World: How to Avoid Irrelevance’, Poros, 21-24 June 2012. You may see the programme and more information here. Speech at the event ‘Euro or Drachma?’, organized by the Athens Chamber of Commerce and Industry, Athens, 13 June 2012. View the invitation here. Speech on the Euro Crisis, at the Workshop organized by the Council for the United States and Italy, Venice, 8-9 June 2012. Mr. Mario Monti, Prime Minister of Italy, was among the keynote speakers. View the programme of the workshop here. See details here. Speech at the event ‘Quo Vadis Europa?’, held in the Ministry of Finance in Nicosia, on 2 May 2012, in view of the commencement of the Cyprus Presidency of the Council of the EU. You may see the invitation here. Speech at the conference ‘The Founders of European Integration’, organized by Konstantinos G. Karamanlis Foundation, on 27-28 March 2012. The title of his speech was What are the stakes today? Participation in the conference ‘The future of economic governance in the EU’ co-organized by the think tank Policy Network and the European Commissions’ UK representation, London, 8 March 2012. 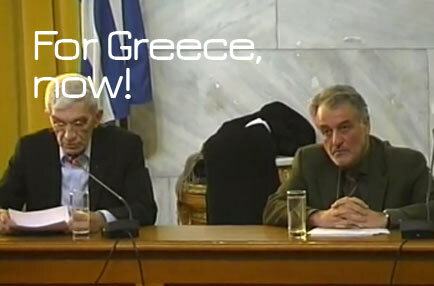 Speech at the event ‘For Greece, now!, 22 January 2012, Hall of the Old Parliament. You may watch the video here. Participation in the debate on ‘The lack of leadership’, organized by Bodossaki Foundation, Megaron Plus, 1 January 2012. You may watch the video here. Speech at the event ‘What kind of EU after the crisis?’, organized by ELIAMEP and European Policy Centre, Brussels, 31 May 2011. This event also coincided with the publication of the book The Delphic Oracle on Europe – Is there a Future for the European Union? 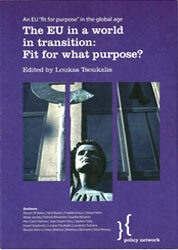 (OUP, 2011) co-edited by Loukas Tsoukalis and Janis A. Emmanouilidis. Participation in the Progressive Governance Summit ‘A post-crisis agenda for the centre-left. Securing shared prosperity’, along with heads of state and government, as well as leading political thinkers and policymakers. Chairperson of the final session of the Summit on ‘Social democracy beyond the nation-state; do we have a distinctive international agenda?’, Oslo, 12-13 May 2011. You may watch the video here. Speech at the seminar on ‘La France et l’Europe face à la crise Économique’, organized by the Centre d’ Analyse of the French Government, Paris, 20 September 2010. The title of the speech was ‘La crise de la dette grecue et l’euro’. Participation in the conference ‘Post-Lisbon: The future of the European Union’, organized by Policy network and IDEAS, Madrid, 26 February 2010. The event marked the launching of the Spanish translation of “An EU fit for purpose in the global age: can we rise to the challenge?”. Loukas Tsoukalis was born in Athens. He studied economics and international relations at the University of Manchester, the College of Europe in Bruges, and the University of Oxford where he obtained his doctoral degree. He taught for many years at Oxford University (University Lecturer in International Relations and Fellow of St. Catherine’s College and St. Antony’s College). He later became Professor at the European Institute of the London School of Economics and Political Science as the first holder of the Eleftherios Venizelos Chair. He has taught in several universities in Europe and the United States. He has advised the former President of the European Commission and former President of the European Council. He is Emeritus Professor at the University of Athens, President of the Hellenic Foundation for European and Foreign Policy (ELIAMEP). 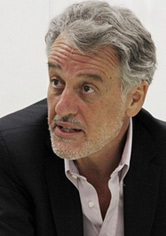 He also teaches at the Paris School of International Affairs (Sciences Po) and the College of Europe. Author of many books including The New European Economy and What Kind of Europe? published by Oxford University Press and translated into several languages. His latest book In Defence of Europe: Can the European Project Be Saved? was published in 2016. Commander of the Order of the Phoenix of the Hellenic Republic and Chevalier de l’Ordre national de la Légion d’honneur of the French Republic. He has received various academic distinctions and awards.